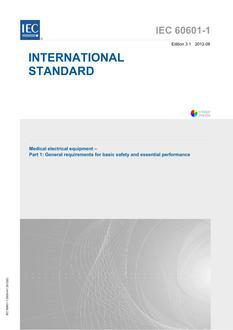 IEC 60601-1:2005+A1:2012(E) contains requirements concerning basic safety and essential performance that are generally applicable to medical electrical equipment. 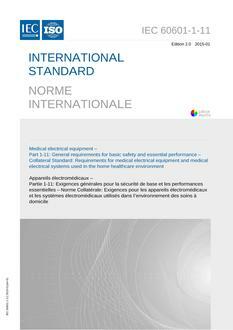 For certain types of medical electrical equipment, these requirements are either supplemented or modified by the special requirements of a collateral or particular standard. Where particular standards exist, this standard should not be used alone. The contents of the corrigenda of December 2006, December 2007 and November 2012, the interpretation sheets of April 2008, January 2009 and May 2013 have been included in this copy. This consolidated version consists of the third edition (2005) and its amendment 1 (2012). Therefore, there is no need to order the amendment in addition to this publication. This is an English version.